Correct. If there are no other signs indicating that it's bus only, then cyclists, motorbikes and moped riders can also use it. Bus lanes and other transit lanes are designed to keep traffic high occupancy vehicles moving as quickly as possible. This encourages people out of their cars and into public transport or a car pooling situation. Some bus lanes are completely separate to other traffic, for example the Northern Busway that passes alongside the Northern Motorway in Auckland; other lanes are dedicated and in force 24 hours a day whereas others are only active at certain times and revert to being normal lanes or parking. There will be signage advising when it's operational and if no times are mentioned, it's 24 hours a day. 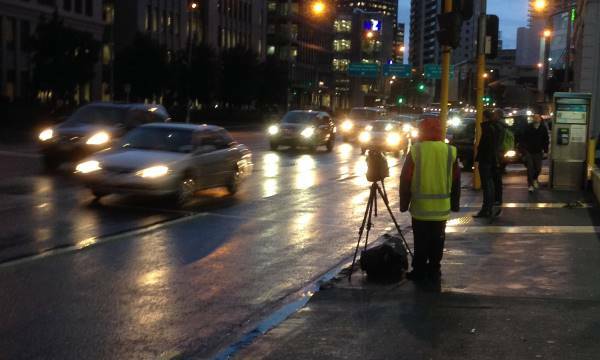 Enforcement officers will video bus lanes (see image below on Fanshawe St, Auckland) and prosecute motorists who are using them illegally. Buses remove around 8300 cars from the morning peak traffic along Fanshawe St alone. 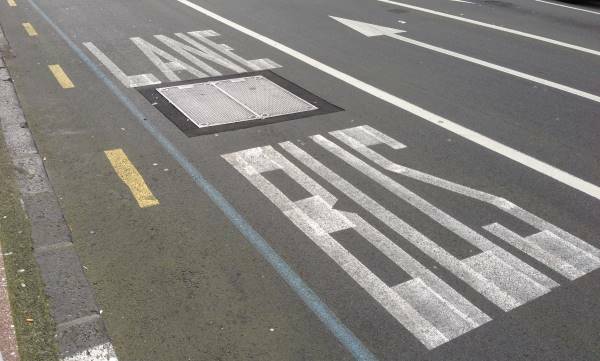 Motorists can drive on bus lanes to turn left if they are within 50m of an intersection or driveway but are liable for a $150 fine if they switch too soon (at least, they are in Auckland). The start of a bus lane is usually marked by a green section on the road. This green marking is sometimes continuous and sometimes not. LANE BUS will be painted on the road periodically, as per the photo below.